The product is available in put-ups of 20 ml, 200 or 500 ml. GOLD as a healing mineral. 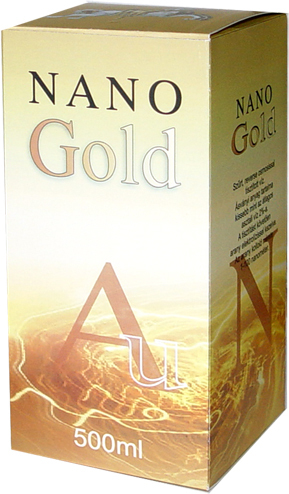 Do you know that good quality gold solution is a natural mineral food-supplement and cures without any side-effects? Ancient Egyptians consumed gold more than 5,000 years ago in order to achieve a mental and physical purification. The efficiency of this precious metal is best proved by the invention of Dr. Robert Koch, the world-famous bacteriologist, by which bacteria causing tuberculosis are not viable in the presence of gold. He won Noble-prize of medicine for his activities. Gold is a researched material nowadays, too. A gold compound has been tested to treat AIDS with, as it inhibits multiplication of the virus in infected cells, too, and it is also applied in the treatment of certain cancerous disorders. Another study demonstrated that gold improves cerebral/mental capacities. Gold colloid, consumed on a daily basis for 3-4 months might improve IQ by even 20%, improve concentration capacities and sharpen the mind. If taken in small particles, gold penetrates more easily into the body than in form of a simple grist, so it is better to break it up in colloid and nano particle size which can be achieved by during the course of a special electronic-galvanic process. - It regulates cardiac pulse, improves blood-circulation, optimalizes body temperature. - It is efficiently used in reducing alcohol, nicotine, caffeine or carbohydrate addiction. - Significantly reduces asthmatic symptoms. - Due to its antibacterial effect, it is the best filling of teeth, used with special predilection by dentists nowadays. Colloid gold doesn't disturb immune system functions when taken internally, its continuous consumption is recommended.